A performance green repair tool with an added clip feature for attachment to belt, pocket or currency. A superior strength magnet keeps your ball marker attached to this custom green repair tool. 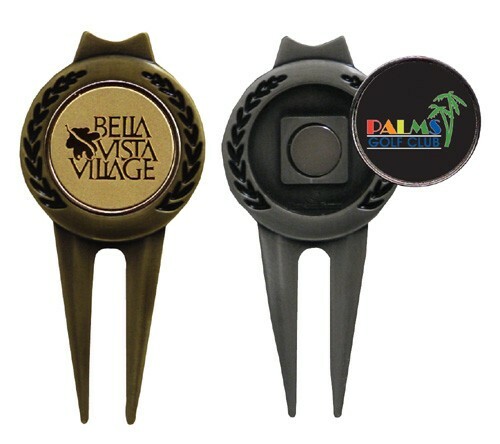 Our removable magnetic ball marker ensures years of play with a full color dome or frosted etch logo imprint. Frosted etch - add $ .50 per piece. 2.75" x 1.375" x .375"
• Imprint area: .875" diameter.